Musto are continually working on the types of fabrics they use to ensure the best quality, results and protection for the wearer. Musto design technical clothing for the Shooting, Sailing and Equestrian markets, which means that they have to stand up to critical tests, allowing them to have a competitive stance within the market. Musto obviously put a lot of thought into their clothing, and what is needed for them to withstand the elements, and any sporting activities. It is therefore no surprise that are the official clothing supplier to sailing’s Team Skandia GBR. Two of the standout technologies Musto uses in their clothing are OutDry® and the D3O® Recoil Pad. OutDry® is a patented technology which provides a waterproof protection barrier to boots and shoes. It works by laminating the waterproof, breathable membrane directly to the external layer of the boot. This is remarkably different from other waterproofing processes because it means that there is no air gap left between the outer of the boot and the waterproof membrane, which occurs when using other waterproof liners. This means that the shoe lasts longer, as no water gets in, and moisture is able to escape. 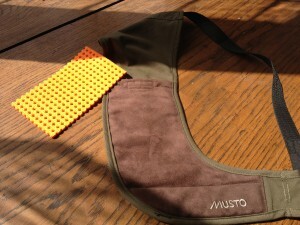 The D3O® Recoil Pad is a shock absorber which is used in Musto’s range of clay Shooting Jackets. 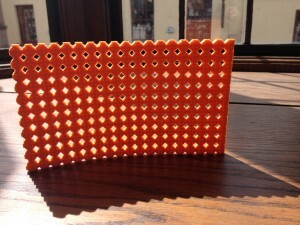 The Pad contains intelligent molecules, and is far more flexible than foam pads. The D3O® moves with the wearer, and the way it works means that the molecules lock on impact forming a bond which absorbs the shock. The D3O® Recoil Pad has been proven to work better than 14 and 7mm Polyethylene foam, 6mm EVA, and 6mm Neoprene. We also stock the Musto D3O® Recoil Shield which is worn over the top of your clothing when shooting. It is reversible, allowing it to be worn by left and right handed shooters, has a non-slip suede surface, an adjustable strap and is machine washable. The shield is good for warmer days when you may not want to wear a jacket, or you want to place it under your jacket if you have nothing to absorb the shock from the recoil of clay shooting. The D3O® Recoil Pad comes with the Shield, and can be purchased instore, or online. D3O, D3O pad, D3O recoil pad, D3O recoil shield, Musto, Musto Arncliffe Country Ankle Boot, Musto Buckden boot, OutDry. Bookmark.